Admission to Mt. Helix Academy is based on an entrance assessment that includes an evaluation of the prospective student’s academic and social skills as well as an interview with her/his parents. 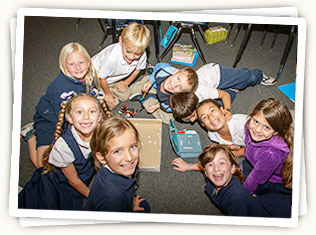 In what must necessarily be a brief period, we nevertheless endeavor to ensure that the school and the parents are of a common mind concerning the prospective student’s education and that the school is likely to be able to provide the prospective student with an effective educational program, one leading to an enjoyment associated with learning and high academic achievement. If you know us already, we encourage you to fill out the on-line Application for Student Assessment. Of course, in lieu of the on-line option, you may download the PDF version, fill it out, and forward it by FAX or mail. We will then contact you to make an appointment for the assessment. Note that the assessment incurs a non-refundable fee that must be paid at the time of assessment. In order to understand first hand why Mt. Helix Academy is so unique and so successful, you must tour the school. Arrange a classroom tour by contacting Alison Young, Assistant Director, or by completing the Online Application for Student Assessment Form and we will contact you. Once we have had a chance to speak with you and to evaluate your child, and we all agree that Mt. Helix Academy is the ideal school for your child, we will need to sign the Statement of Mutual Commitment, the essentials of which appear in the document you may access above. You will then need to complete an Enrollment Form as well as a Payment Agreement Form. Mt. Helix Academy organizes several events that you may wish to attend to introduce you to our school, our faculty, and our extensive program. Watch for the announcement of these events on this website in the News & Notes section and in the school’s Calendar.